World Open Space on Open Space comes to U.S. 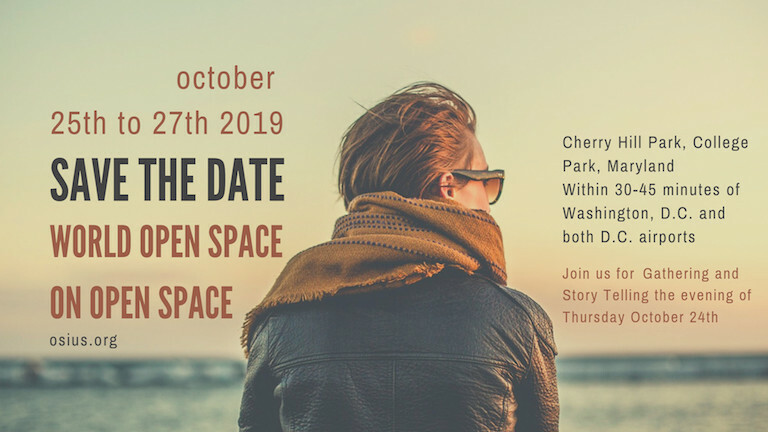 The World Open Space on Open Space (WOSonOS) comes to the United States this year, the first time since 2013. The confirmed and committed dates are Friday October 25 through Saturday October 27, with an evening of Gathering and Story Telling on Thursday October 24. Open Space Technology was discovered by Harrison Owen as a better way to unleash the power of self-organization in teams, organizations, and communities. The Open Space Institute of the United States (OSI-US) believes that inspired behavior can be an everyday experience and that humanity is limited by its perceptions of the possible. The OSI-US was created to grow that sense of possibility and make it a reality by focusing on: learning, research and practice. Peggy Holman: What's so great about Open Space Technology? Videos Requested: What's so great about Open Space Technology? Wait. What's So Great About Open Space Technology? Open Space Technology is an interesting "whole group" process. This is NOT complicated. So: what EXACTLY is the big deal? What's so great about Open Space Technology? YOU are invited to answer this question! The Open Space Institute U.S. cordially invites you to participate in our "What's So Great" Video Program. All you have to do to participate is answer that burning question, in 2 minutes or less, via VIDEO. What's so great about Open Space Technology? The goal is to create an absolutely astonishing set of videos that make people laugh (and perhaps cry,) as they browse these short video testimonials. Your uploaded video will be immediately inspected by OSI-US. And if all goes well, we will immediately post it to the newly created Open Space Technology channel on YOUTUBE. We will also link to it from the OSI-US web site, and utterly promote it (and YOU) across all of social media, across all time and all space, open or otherwise, forever. "What's so great about Open Space Technology?" 3. All videos submitted must be absolutely free of any shameless marketing hype. You may however tastefully (and optionally) display your website URL for up to 10 seconds. You can edit it in, or simply hold up a handwritten note if you wish. Please keep it short, tasteful and non-sales-oriented. Ten seconds max. 6. NOTE: By uploading your video, you are explicitly granting OSI-US a perpetual, non-exclusive license to publish your video, worldwide, across any and all media, without exception, forever, until the end of time, or the end of the world as we know it, whichever occurs first. You are invited to play the game! Kate Megaw: What's so great about Open Space Technology? Richard Dolman: What's so great about Open Space Technology? Suzanne Daigle: What's so great about Open Space Technology? Anne Stadler: What's so great about Open Space Technology? Harrison Owen offers even more profound reflections on Sunday morning, January 16, 2016, at the event "Opening Space for High Performance and the Practice of Peace"
Harrison Owen offers some profound reflections on Saturday morning, January 16, 2016, at the event "Opening Space for High Performance and the Practice of Peace"